Thanksgiving will be here before we know it and I cannot wait! I enjoy getting together with my family over a delicious meal and having lots of fun. I’m also really excited for my oldest daughter to come for a visit. She’s away at university and her first visit home will be Thanksgiving weekend. I need to make sure it’s a dinner she won’t forget. Getting ready for Thanksgiving can seem like a daunting task. I’ve left preparations till the day before and told myself never again. It’s way too stressful. Now that I’ve learned my lesson, I’m planning ahead and you can too! 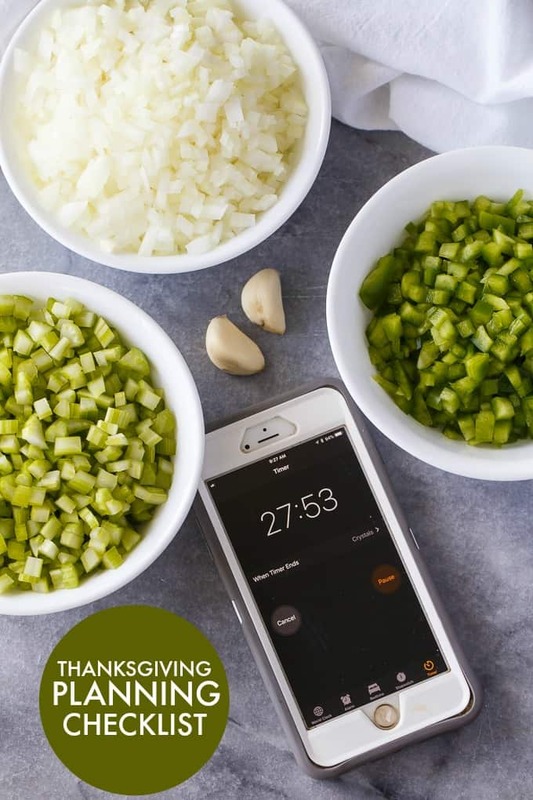 I’m sharing this simple Thanksgiving Planning Checklist to help you prepare for the big day and make it go off without a hitch! Invite guests. Call, text or email the people you want to come. I think three weeks in advance is ample notice. Plan the menu. I have grandma’s recipes that we make every year, but I also like to add in a few new dishes. I typically browse recipe sites on my mobile phone and bookmark the ones I like. Make a grocery list. I make my list on my phone so that I’ll never forget my list at home. My mobile phone is always with me. I even organize the list into sections so I can get in and out of the store faster. Buy a frozen turkey. It’s important to buy the turkey (if that’s what you’re serving) ahead of time so you don’t miss out. Everyone and their mother is buying turkeys this time of year so shopping early saves disappointment. Find decorations. My Thanksgiving table is fairly simple. I find our fancy tablecloth, napkins, napkin rings and a pretty centrepiece. Wash your china. Pull out your china dishes and wash them. Chances are, they are dusty if you don’t use them everyday. Confirm with guests. Finalize the guest list and send out reminders if you need to. Clean the house. I typically spend a full day cleaning the house from top to bottom. I concentrate on the guest bathroom, kitchen and family room where people will be spending most of their time. Make room in your front closet for coats, too. Start defrosting turkey. Turkeys take FOREVER to thaw so start doing it early. Make room in the fridge. You’ll need room for the extra food you are going to buy and all the leftovers! Get groceries. Grab your mobile phone where you made your shopping list and hit the stores. Go early in the morning or towards closing time so it’s not as busy. Spot clean house. Give your house a quick tidy to make sure it’s still neat. Start preparing food. Make as much as you can ahead of time so there’s less to do on the big day. Chop the veggies that you’ll be using and store them in the fridge. Tip: Set the timer on your mobile phone to alert you when recipes are done baking/cooking. Set table. Decorate with your decor that you found a few weeks ago and set out the china so that each place setting is ready for your guests. Spot clean house. The cleaning never ends, but it needs to be done daily! Bake the turkey. Turkeys take forever to bake so put it in early! Cook the rest of your food. Heat up the food you made yesterday so it’s nice and hot to serve. Eat. My favourite part of the day! As you can see, I use my mobile device a few times when I’m preparing for Thanksgiving! I recommend visiting The Mobile Shop to check out their phones and plans when you are out picking up your groceries. They are found in select Loblaws, Fortinos, Zehrs, Atlantic Superstore and Real Canadian Superstore locations. I love that I can earn tons of PC Optimum points on select phones and plans from The Mobile Shop. One-stop-shopping for the win!